The Shepherd with his sheep are coming around the hand shaved tree to pay homage to baby Jesus while Mary gazes on. 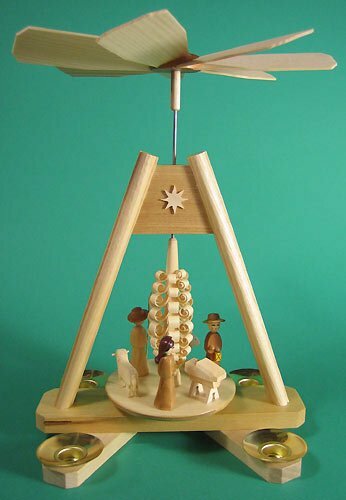 Nativity Tree Christmas Pyramid stands about 9 1/2 inches tall and requires 4 medium. candles to turn. Made in Seiffen Germany. Handmade by the artists at the Artisan Coop. With our German Pyramids - Charming memories unfold as you watch the delight in the eyes of the children both young and old.